You probably know this: urgency and scarcity both help make more sales. All these entrepreneurs opening their online course for a limited time only, all those « limited time discounts » you can find all over the web... They are all there to add urgency to their offers and make you act NOW. Your time is limited. Go. Get. The. Offer. Or it disappears forever. 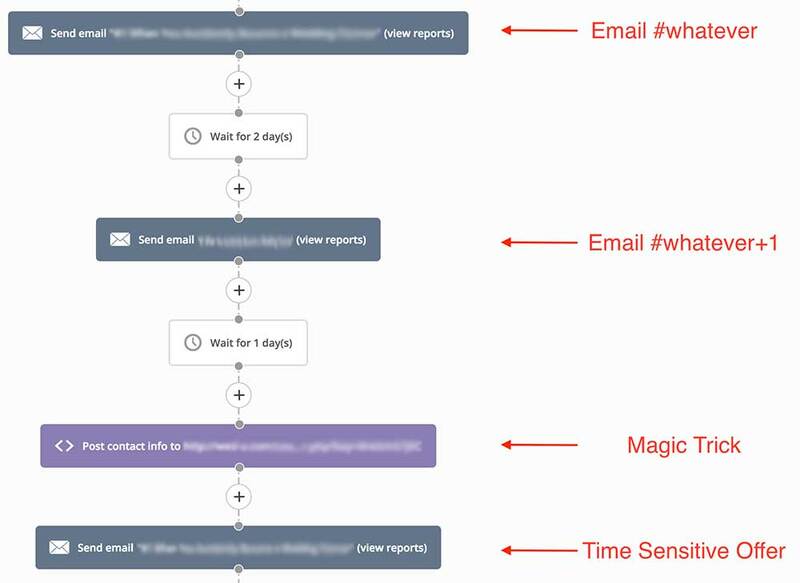 Today, we’re going to see how to create real urgency by leaving 5 days to your subscriber to take action and buy your product while building your audience. Some of my clients come to me with a product but no audience. I’ve done it too. Guilty. But if you have a great product — and a fit with your market / audience — it’s no big deal: you can start acquiring subcribers with a smartly targeted Facebook Ads campaign (or AdWords or other ad network depending on the situation), a cool lead magnet to collect emails and then put them in your sales funnel. So with this problem in mind, I took a day off to figure out the best approach. For those who don’t know Zapier, it’s an amazing tool that allows you to connect various apps together. You use one app as a trigger — something happens on this app will trigger the « Zap » — and one app as the action to do once the zap is triggered — something will happen in this app. For instance, I track every sale made on WooCommerce by a customer by adding an ActiveCampaign Tag — the tag name being the name of the product — to the customer. Handy to send them updates or cross-sells. Still a great app, still love you guys but this would have made my life even easier. If you have a Web Developer or a Tech savvy guy in your contacts, just send him the link to this article, you’re set. I strongly recommend ActiveCampaig﻿n on this one, it’s really cheap to get started and there are a lot of automation features that other software lack (adding tags for instance). Way cheaper than InfusionSoft and I’ve heard InfusionSoft is pretty tough to handle at first... Not the case for ActiveCampaign. Anyway, my code is written to work with ActiveCampaign but as long as you can post web hooks with your email automation software, you’re good to go — you will probably have to tweak the first part of my script to extract the subscriber data though. First, let’s create a WooCommerce API access (and make sure everything is activated). 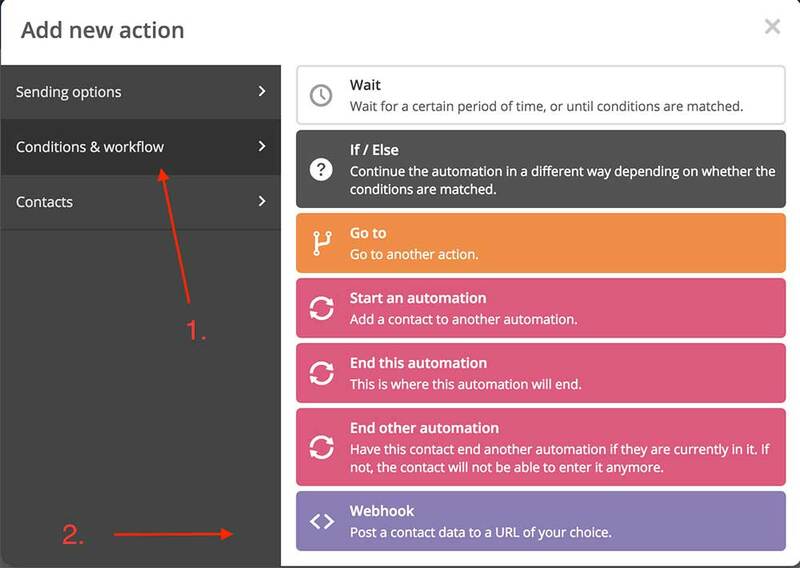 Then, let’s create an automation workflow in ActiveCampaign. Right before the last email (Time Sensitive Offer) we need to create a coupon that will expire after the duration of the discount. This is what happens on the "Magic Trick" line. I use a webhook. We are basically saying to Active Campaign to post the subscriber's data to a PHP script on your server. I’m sure we could figure out something a bit more complex, but this should do the trick (as always if you have a suggestion for a smarter solution, use the comments below). You can have fun with the coupon parameters — the WooCommerce API documentation is available here — to customize then however you want. If you generate a custom coupon code, you need a way to put it back in the email you’re sending for the promotion. I just thought the simpler the better. Each time your subscriber reach that step before getting an email about the time sensitive offer, ActiveCampaign will send his or her info to the PHP script which will in turn create a WooCommerce coupon. The code of the coupon will be the subscriber’s email, it will expire in the number of days you’ve set and will be limited to his email address. A smart thing to do will be to remember your subscriber the day before the discount ends in case they forgot — and you can use ActiveCampaign’s Tags to make sure they didn’t purchase before spamming them again. As always, feel free to use the comments if you have questions, happy to help. Want this on your WooCommerce? I’m kind of scouting the interest for a specific plugin to do that for you without having to do some custom PHP or get out of WordPress, so let me know in the comments if this is something you’d like to see available online. Update: since writing this post, other solutions have popped up online. If I were to work something out right now, I would check out Thrive ﻿Ultimatum which should handle everything you need — and more, friends have had amazing results with it.